Samantha Mooney will receive her Bachelor’s degree from Barrett, the Honors College at Arizona State University in May 2019. She will graduate with her BA in Justice Studies, a minor in Non Profit Management and a certificate in Cross Sector Leadership. At ASU, Samantha has been involved with the Public Service Academy, a four year program that prepares undergraduates to facilitate collaboration in approaching society’s complex problems. She has also been engaged in increasing civic engagement and voter turnout of young people, educating students about domestic and sexual violence and connecting students to impactful service around social justice issues. In the last few years, Samantha has worked with philanthropy groups, non profits engaging business leaders in community reform and currently works at the Global Pathways Institute which focuses on advancing career development in education in collaboration with business, government and school leaders. 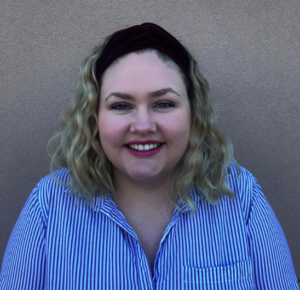 Samantha is a 2019 Teach for America corps member and will be teaching elementary students in Colorado Springs beginning this fall. At the Idea Café, she will be presenting her findings from the undergraduate, honors thesis about how organizations and companies can create more inclusive workplaces.